Since our inception in 2000, our company has expanded significantly. From our offices in Concord and Peterborough, our team installs Building Automation Systems that maximize comfort, while reducing consumption of electricity and natural gas. We employ in-house Mechanical and Electrical Engineers, Programmers, Technicians and Graphic Designers. Our skilled team of in-house Electricians and Service Technicians comes complete with a fleet of service vehicles. All Reliable Controls Dealers must complete the mandatory Dealer Certification Program. In line with our commitment to ongoing continuous improvement, Setpoint believes strongly in having each and every one of our team members complete the certification process. We are often contacted by businesses abandoned by their controls contractor, or Facility Managers who feel they are being charged exorbitant fees. Our service is second to none and our rates our upfront and fair. We have earned a solid reputation in the industry as a Building Automation contractor that excels in client support, a core value that is extremely important to our company. An expedient response minimizes complaints from building occupants to management, and of course, from management to us. Our entire team has a vested interested in resolving BAS related issues in a rapid and thorough manner. 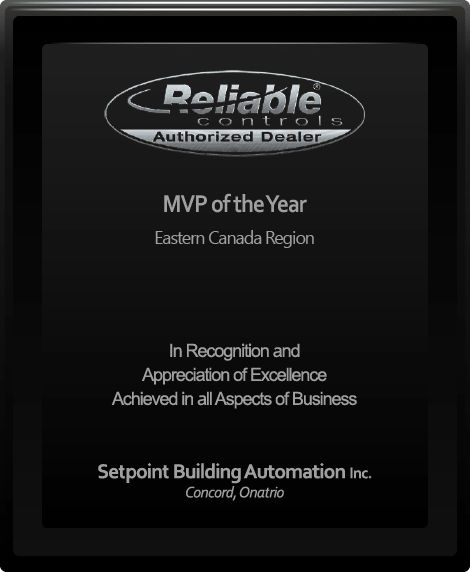 Setpoint Building Automation Inc. has been awarded the Reliable Controls Yearly MVP Award 14 times including 2017. Through the hard work of all our staff, Setpoint has achieved "Diamond" Dealer Level, the highest Dealer Level Reliable Controls currently offers. We will work closely with you to ensure we help solve your environmental challenges." ©2019 Setpoint Building Automation, Inc.